This plant, known from early days as hemlock or wild hemlock, has a number of other common names, a few of which are snakeweed, spotted parsley, poison-root, wode-whistle. An erect, much-branched biennial with round, smooth, hollow stems from two to six feet high, covered with purplish spots which usually disappear on drying. The leaves are large, shining, decompound, with finely-cut leaflets, which have a very foetid and characteristic mousy odour when crushed. The leaves are much more delicate in outline than those of the water hemlock (cf. illustrations), the ultimate segments ending in a small, colourless, bristle-tip. The flowers are small, white, in large loose umbels, with a circle of bracts or small leaves at the base of the umbels. The fruit or "seed" clusters, as they are popularly called, are conspicuous in late summer and autumn. Each fruit is composed of two parts, so close together as to resemble one round seed, somewhat flattened on each side, with wavy ridges running from top to bottom. Each part contains one seed, which is deeply grooved on the inner face. The root is from eight to ten inches long and about one inch in diameter, tapering, sometimes forked. It smells very much like the parsnip. The plant is in bloom from June to August. Naturalized from Europe, the poison hemlock is found in waste places, chiefly on dry ground from Nova Scotia to Ontario, also in British Columbia. It is a question as to which part of the plant is most poisonous, since authorities differ, but, as fatalities have resulted from the consumption of even a very small portion of the leaves or seeds or roots, it may well be said that the whole plant is deadly. It seems that early in the summer the poisonous properties are most abundant in the green leaves, and that later on the seeds are the most toxic, particularly just before ripening. As the poisons are volatile the plant loses its toxicity on drying, and consequently is not so dangerous to animals when dried with the hay. The seeds, however, are most poisonous when fully formed but still green in colour. When fully ripened their toxicity gradually diminishes. The plant contains the very poisonous alkaloid coniine, a colourless liquid which gives the plant the characteristic, disagreeable, mousy odour. The poisonous coniceine and the alkaloid methyl-coniine are also present. as well as other substances. Greenish states, "Hemlock herb contain-coniine and conhydrine. These alkaloids are present in both stem and leaves in largest quantity when the plant is in full flower." After flowering the alkaloids pass to the fruits and become concentrated in the partially ripened seed. Many cases of poisoning of domestic animals have been reported from the United States. The plant is evidently most injurious to stock early in the season, when its foliage is fresh and other herbage is scarce. Poison hemlock is very well known historically as a plant of evil reputation. It was in all probability the plant used by the Greeks in the preparation of their poisonous draughts, and by which Socrates, Phocion, and others met their death. Fatalities have also occurred by mistaking the plant for some edible species. 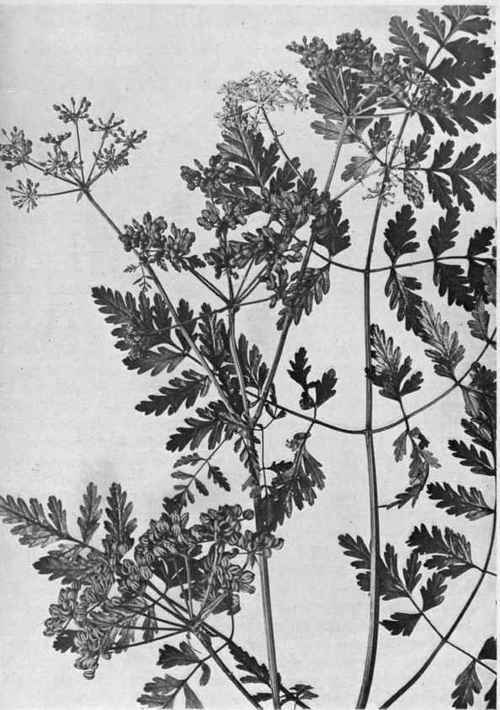 An old English herbalist says, "If any, through mistake, eat the herb hemlock instead of parsley, or the root instead of parsnip, both of which is very likely, whereby happeneth a kind of perturbation of the senses, as if they were stupid and drunk, the remedy is, as Pliny saith, to drink of the best and and strongest pure wine, before it strikes to the heart, or gentian put in wine." The seeds have also been used in error for those of anise. Small boys have been poisoned by making whistles out of the hollow stems of the plant. Hemlock has long been recognized as a very dangerous narcotic plant. H. C. Long says, "Even the smallest quantities may cause inflammation of the digestive organs, paralysis, and death." The general symptoms, as given by Long, are salivation, bloating, dilation of pupils, rolling of eyes, laboured respiration, diminished frequency of breathing, irregular heart action, loss of sensation, convulsions, uncertain gait, falling, and, at the end, complete paralysis. Death occurs after a few hours. The poison acts on the motor nerve endings, causing paralysis, dyspnoea resulting from paralysis of the pectoral nerves, and acceleration of the heart from that of the inhibitory fibres of the pneumogastric. Small quantities cause in the horse a little prostration, yawning, acceleration of pulse, dilation of pupils, and sometimes muscular spasms of the neck and shoulders. Large quantities cause nausea, unsuccessful attempts to vomit, gritting of teeth, accelerated respiration and dyspnoea, and muscular tremors commencing in posterior members and spreading to anterior members and spine. There is next difficulty of locomotion, sweating (but not continual), falling, paraplegia, then paralysis, loss of feeling, lowering of temperature, rapid pulse, increasingly difficult respiration, and death from stoppage of respiration. With cattle there is excessive salivation, cessation of digestion, bloating, constipation, weakness, and stupor. The milk of cows who have eaten the weed has a disagreeable taste. Chesnut says in cows there is "loss of appetite, salivation, bloating, much bodily pain, loss of muscular power, and rapid, feeble pulse." H. C. Long states that in sheep the abdomen is tucked up, the animal has a dazed appearance, there is dilation of pupils, unsteady gait, the hind limbs being dragged, coldness, and death after a few convulsive movements. In the pig there is prostration and inability to move, coldness, slow breathing, livid mucous membranes, imperceptible pulse, paralysis, particularly of the posterior members, and no convulsions. Remedy and Means of Control: In the event of poisoning, professional advice must be promptly summoned. While waiting for assistance the system should be relieved of the poison as soon as possible by use of an emetic. Stimulants may then be given, and warmth applied to the extremities. This weed should not be allowed to stand on any farm or roadside. It should be grubbed out and promptly destroyed. In no case should it be allowed to go to seed.